If you love metalworking and wire work jewelry making, you're sure to be interested in fold forming. This fascinating jewelry metalwork technique allows you to make wonderful 3D shapes and textures. Fold forming is a metalwork technique invented in the late 1980's by Charles Lewton-Brain. Amazingly, it's the first innovation in metalworking in thousands of years. Exciting in itself! Imagine, for thousands of years, human beings have worked with metal, yet this technique - a simple technique typically involving sheet metal, hammers, a pounding surface like an anvil or stakes, and annealing - was invented so recently! For some reason that just blows my mind. The basic process of fold forming is simple. 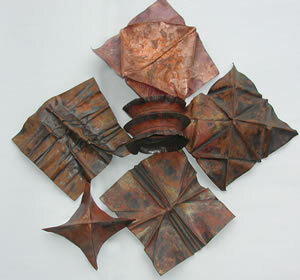 Metal is folded, repeatedly forged and annealed and unfolded. "Forging" simply refers to the shaping you do with hammers, and annealing is a softening process involving a torch. There are several types of folds including the T-fold, pleated fold, Adams fold, rolled fold and Rueger fold. The photo on the right is an example of a T-fold with crosslines. If you're interested in getting your hands dirty and making some magic happen, its simple to get started with fold forming. There are fold forming videos you can watch, tutorials and books, and you might even want to get in on a workshop if any come up in your area. If you do any metalwork, you'll likely have many of the tools you need because there isn't anything exotic about the tools. Raising and forging hammers and a planishing hammer are useful, and you'll want a paper or rawhide mallet too. Anvils and stakes are necessary too. If you're just starting out, get an anvil. That's what I use and it's just about perfect for anything I've tried so far. You'll also need some shears to cut the metal sheet, and something you can use to pry open the fold. A knife should do, and I bet you'll find an assortment of jewelry pliers and a vise comes in handy too. For the annealing you'll need a suitable torch (even a butane chef's torch should work well enough for silver or copper) and a soldering pad or other heat resistant surface. For my annealing, I use a big aluminum lasagna tray (you know, the disposable ones?) and the clay kind of kitty litter (not the clumping kind). Kitty litter works a charm. As to practise materials, try using thin copper sheet that's .5mm thick. It's often sold as "roofing copper" and shouldn't be too hard to find at home building supply stores. Here's a wonderful video showing how to do a "Rueger Fold". Absolutely do-able, even for a novice metal worker, yet the results will definitely impress your friends and family. Now that you've been introduced to fold forming, I bet you itching to try it yourself. See the picture to the right? That photo was taken by a lady who was experimenting with fold form jewelry making. Pretty impressive, but you can do it too. 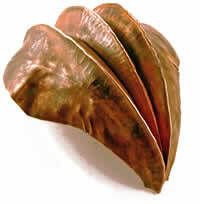 Imagine what you could make just using some basic silver smithing tools, a little roofing copper, and some practice. Reader Review: This gorgeous book addresses a huge family of forming techniques, a family that is still under active exploration. 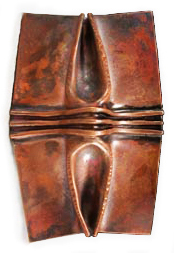 These techniques create a wide range of varied forms, and add to the traditional methods of fabrication as much as they draw from them. If you have any experience in metalwork, you'll find plenty to add to your existing skills, and at least as much that your current knowledge can add to what's presented here. Clear, descriptive photos fill just about every page. These pictures serve three major purposes: they instruct in technique, they show the kinds of results that each technique can create, and they display masterworks that exemplify the finest results experienced crafters can produce - sometimes, all at once. Artisans at every level will find something they can use. Someone with just a hammer and bench block can get great results, as can the maker with access to a powered rolling mill and hydraulic forming press. My one peeve with this book, and it's just a small one, is that Lewton-Brain never specifies the thickness of materials to work with. I know that he encourages direct experience and experimentation, but the beginner might want to know whether to start closer to 24ga or 12ga sheet - it makes a difference. One thing that makes this book attractive is its emphasis on inexpensive materials, the kind you don't mind making mistakes with. Samples in gold and silver appear, of course, but nearly all of the demonstrations use copper - not just because of cost, but also because of its unique working properties and the many kinds of surfaces it yields. The big appeal, however, is not just the organic beauty of the results, but the sense of play and exploration that pervades this book. I can't think of any other book on any craft that conveys so much pure fun in handling the material. Brainpress.com is crammed with fold forming information. Center for Metal Arts has information on upcoming workshops with Charles Lewton-Brain himself. 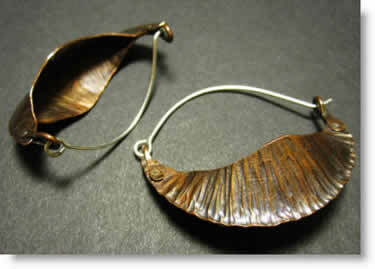 Top photo: Beginner Fold Forming Earrings byClaire Sommers Buck.